Durable stainless steel structure, corrosion-resistant and easy to clean. Adjustable stainless steel legs make it the ideal working height for your cooks. Two independent manual control burners to save the energy. Thick stainless steel radiant plate, for quick and even heating. Highly efficient stainless steel burner, standby pilot. Quickly and easily cook a variety of your most popular dishes with ATOSA US ATMG heavy duty manual control countertop griddle! This griddle features individually-controlled burners to make quick work of almost any meal in your business and also save the energy. 30000 B.T.U./h for each burner. The burners sit underneath a thick griddle plate that heats quickly and evenly so that you can produce the best product for your hungry customers. This griddle’s exterior is made of long-lasting durable stainless steel. The stainless steel landing ledge helps protect your manual control knobs from spilling grease, and the welded splash guards prevent liquid from hitting your walls and other equipment. This griddle also comes with a slide-out grease pan for fast and easy clean-up. The low-profile design makes this unit great for kitchens where space is at a premium, and thanks to its 4″ adjustable legs, you can make it the ideal working height for your cooks. Very large well made griddle. Cooks with extreme proficiency. Great for whipping up bacon, burgers, cheese steaks,this counter top griddle is an efficient and durable addition to your kitchen. 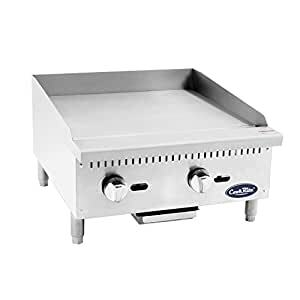 A solid, well built flat top that heats evenly and warms up fast. We use it for our breakfast items and for select sandwiches.This is a great addition to any cooking line .